I practice hitting short putts, not to hone my technique but to hone my nerves. I do this through a practice game which I recommend to you. It's very simple. Try to make 25 short putts in a row. Start with two-footers - and that's not as easy as it may sound. When you get close to number 25, the tension will be palpable, especially if you've made a promise not to leave the practice green until you've made 25 in a row. Once you've made all the two-footers, move up to three-footers (and plan to be out on the green for a while). 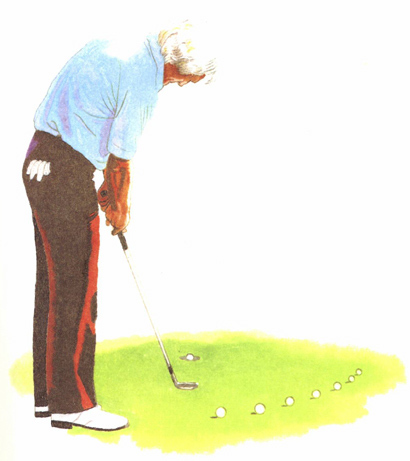 When I have an all-out practice session, I'll also go on to four-footers, and on rare occasions I'll even get as far as the five- and six-footers. I've made 25 consecutive six-footers only a couple of times In my life, but on those occasions, I can assure you, I left the practice green with tremendous confidence in my putting and my nerves.